The Great Plague of Marseilles is a misnomer. It was the opposite of “Great”, causing death, depopulation and widespread deprivation on an almost unfathomable scale. Histories of the plague often note that the population of Marseilles recovered relatively fast. It was back at pre-plague levels less than fifty years after it devastated the city. That is an uplifting coda to a horrific event, but it does nothing to temper the sheer human misery that beset both the city and surrounding countryside from 1720-22. One of the few physical remnants left from the time of the plague can be found in the Vaucluse region, northwest of Marseilles. 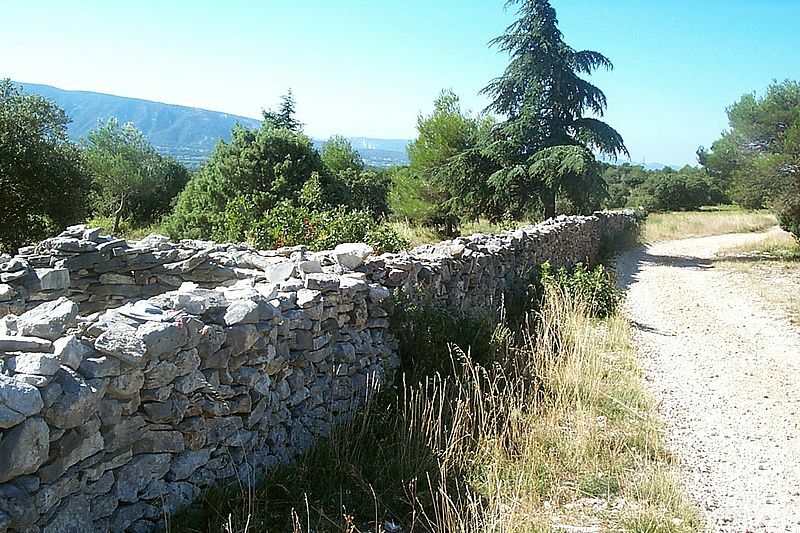 Here a crumbling, dry stone wall is the only trace left of a barrier that once stretched for 27 kilometers between Provence and the Comtat Venaissan (County of Venaissan). In front of the wall was a ditch and parapet of earth, a bit back from the wall were sentry posts manned by guards that stopped anyone from the south trying to travel beyond it. Known as the Le Mur de la Peste (The Wall of the Plague), this was an attempt to create a physical barrier that would contain the plague. The problem was that south of Le Mur it had already spread, with lethal results. This brings up a second reason the Great Plague of Marseilles is a misnomer. 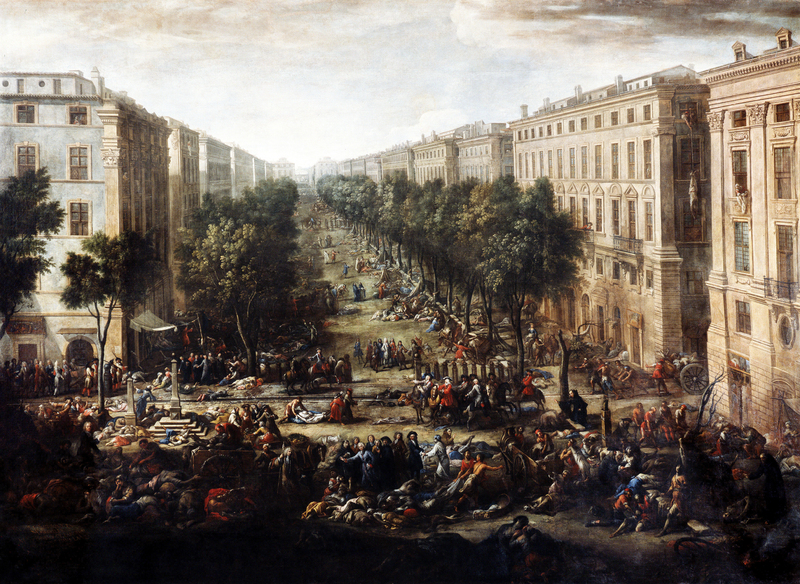 The plague affected an area much greater than just the city of Marseilles. The surrounding countryside was hit almost as hard. The scope of the suffering is hard to grasp even today. The first hints of plague in Marseille had begun about a month after the arrival of the Grand-Saint-Antoine ship at the port in May of 1720. Its cargo of silk fabric and cotton loaded on the Levantine coast carried the seeds of southeastern France’s destruction. The outbreak was slow, but began to expand at the beginning of July when two women in the city died. They showed symptoms of the plague before they succumbed. Then eight days later, doctors attending a gravely ill twelve year old boy diagnosed his illness as plague. They alerted a city alderman who spread the word. Precautions were taken to seal the homes of those who were believed to have died from the disease. This did little good because it had already spread. On August 9th, the first day of one hundred deaths occurred, with many more to follow. Less than two months after the first sign of an outbreak, every district in Marseilles was consumed with the stricken. The horrors of the plague would end all too often in death for the sufferer, but the living were also witness to horrifying scenes. 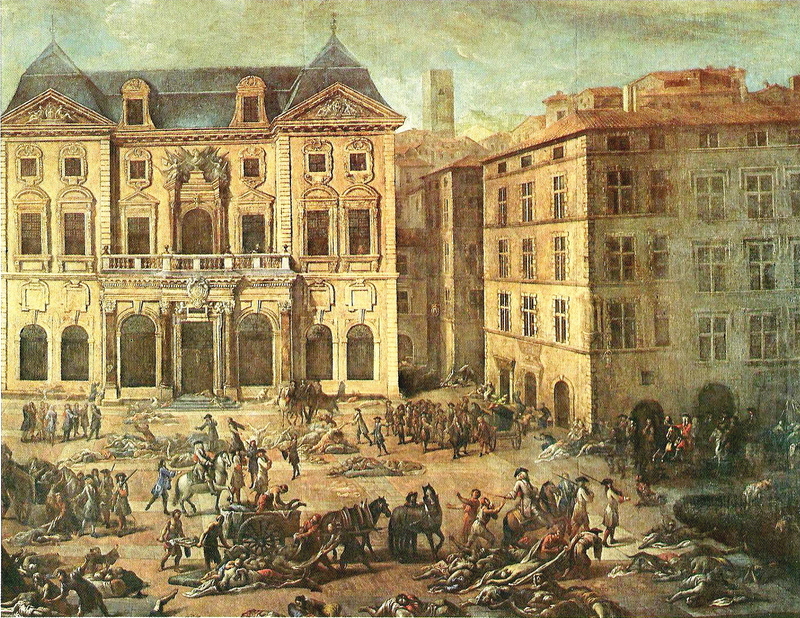 The strain of plague that hit Marseilles with such deadly force was bubonic. Caused by the Yersinia pestis bacterium, bubonic plague is transmitted through the bites of fleas which breed on vermin. It infects and then rapidly multiplies in the lymph nodes, causing painful swelling which forms bubos, a sort of dark blister usually found in the groin, armpits or neck area. Bubos were the nasty hallmark of this type of plague. For treatment at the time, doctors would burst them, falsely believing that this would lead to a cure. In reality, it was a totally ineffective form of treatment. Those infected suffered from a range of ever worsening symptoms including ferocious bouts of fever, painful muscle cramps, gangrene, bloody vomiting, coma and finally death. First hundreds, then thousands in Marseilles were beset by these maladies. Hospitals quickly became overwhelmed. The rudimentary public health infrastructure of Marseilles could not cope. Infirmaries ran out of room to hold the dead. Bodies were tossed out into the street, exacerbating the crisis. The close quarters of the old town acted as a breeding ground. Most of those suffering were left to die at home. Whole families succumbed. Homes of those who had died underwent combustion with sulfur, this did little good. Bodies were thrown in mass graves filled with quicklime in another futile attempt to fend off the pestilence. At one point the situation grew so extreme, that a thousand people were said to have died in a single day. Whole sections of the city lost almost all of their population. Outlying areas in Provence feared they would be next. By mid-summer the situation had turned so dire that a provincial court in the nearby city of Aix passed legislation making communication with anyone from Marseille a capital offense, punishable by death. At about the same time, Le Mur de la Peste was erected. A two meter wall and armed guards could only do so much. Aix ended up getting suffering grave casualties, losing a quarter of its population. The city of Arles suffered just as much. The plague was at its worst in the Mediterranean ports. In Toulon the mortality rate was 50%. In Marseille the plague finally began to lessen in the autumn with the advent of cooler weather. Deaths had fallen to one per day by the winter of 1721. The worst was over, but this bout of bubonic plague was not finished with Marseilles. In the spring of 1722 there was another outbreak, causing mass panic and more deaths. It would take twenty-six months before the Great Plague of Marseilles had completely run its course. The demographic changes wrought upon the city as well as southeastern France were staggering. It is estimated that Marseilles lost approximately 50,000 of its 90,000 pre-plague population. That same number died in the provincial hinterlands. This sent the economy into a tailspin. Strangely enough it did not take very long to recover. The city took measures to protect the population from another outbreak. Port sanitation facilities were upgraded. Cargo would now be offloaded straight from the water into a quarantine facility that was surrounded by fifteen foot high walls. This only took place after inspections on an offshore island. Crews were vetted just as closely. Such measures helped, but they could never bring back the 100,000 men, women and children who died as the result of the last major plague to strike Europe.